Stamping with a Passion! : Happy Birthday!! Hello everyone!!!! Taylored Expressions is celebrating their 6th birthday all month....Happy Birthday TE!!!! Also, we have lots of family birthdays coming up so I have been making birthday cards....I will be able to use this one for either a boy or a girl. Who doesn't love ice cream cones...yummm!!! 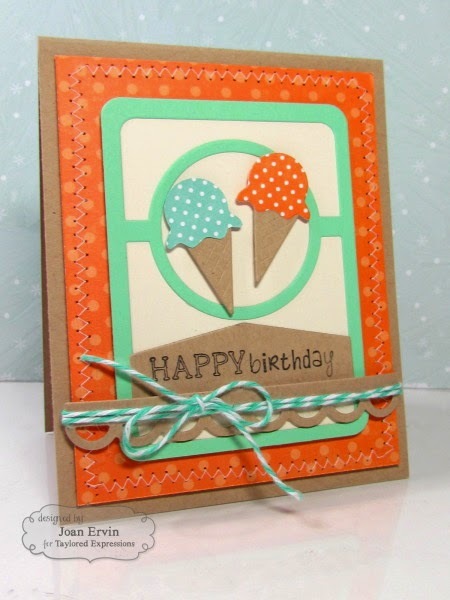 They were created with the Taylored Expressions Little Bits - Ice Cream Cone dies.....sooo fun!! 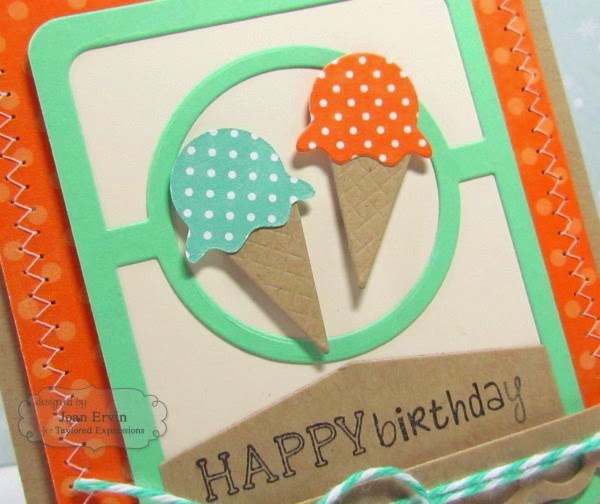 Choice Kraft card stock was used for the cone and papers from Echo park's Dots 6x6 paper pad was used for the ice cream. The background was created with the TE Pockets and Pages - 3x4 Circle Showcase die and the sentiment from TE's Workplace Wishes set was stamped a diecut cut with a die from the TE Pockets and Pages Essentials - 4x6 die set. The TE Open Scallop Border die was used to cutout the Choice Kraft scalloped border and sewing and twine finish it off. Thanks for stopping by....I am headed to my parents home this morning. We are going to clean out some bathroom cupboards....oh boy, how fun is that!!! LOL!! It might give me a little incentive to clean my own....then again, it might not!!!! Have a great day!!! Super cute polka dot ice cream, Joan! I love these fun colors! What a wonderful birthday design!